As soon as Sister Act opened on Broadway, my mother, a Whoppi fan, notified me that she wanted to see the production. So, when my aunt, a fan of the 1992 film, recently visited town, she thought that it was the perfect occasion and treated us both to a Sunday matinee of Sister Act. No doubt, it is hard to fill the shoes of Whoppi Goldberg (also lead producer of this show); however, the svelte and statuesque Patina Miller, who plays Deloris Van Cartier, does a fine job in this glittery production. While not as comedic as Whoppi, she and the supporting cast shine and sure can belt out a disco inspired tune in this show about a nightclub singer who goes into hiding in a convent, which is on the brink of closing down, after witnessing her goon boyfriend commit murder in a grungy Philadelphia in the 1970s. 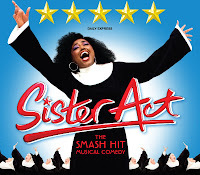 While not as clever and edgy as the other splashy musical comedy on Broadway, overall, Sister Act made my mother smile. It made my aunt smile. And heck, since I love stained glass, big musicals and haven't had a nun fix since The House of Blue Leaves, it made me smile too. What a perfect way to spend a Sunday afternoon - at the theater with my family.